Microsoft finally revealed the much rumored and anticipated Xbox 360 Elite. Quote from the Press Release: REDMOND, Wash. — March 27, 2007 — Microsoft Corp. today announced the upcoming availability of Xbox 360™ Elite, a new model of the video game and entertainment system that will include a 120GB hard drive, a high-definition multimedia interface (HDMI) port, a high-definition cable, and a premium black finish for the console, wireless controller and Xbox LIVE® headset. Xbox 360 Elite has enough space for a library of Xbox LIVE Arcade games and thousands of songs, as well as downloadable high-definition TV shows and movies available on Xbox LIVE Marketplace. The new 120GB hard drive also will be sold as a stand-alone accessory to give current Xbox 360 owners greater choice and flexibility in their games and entertainment experience. Additional Xbox 360 Elite accessories, such as the black Xbox 360 Wireless Controller, Xbox 360 Play & Charge kit and the Xbox 360 rechargeable battery, will be available separately. The Xbox 360 Elite and its accessories are expected to begin arriving in U.S. stores on April 29. "Today’s games and entertainment enthusiast has an insatiable appetite for digital high-definition content," said Peter Moore, corporate vice president for the Interactive Entertainment Business at Microsoft. "Xbox 360 Elite’s larger hard drive and premium accessories will allow our community to enjoy all that the next generation of entertainment has to offer." • Xbox 360 Elite console. The console is equipped with a premium black finish and three powerful core processors capable of producing the best in HD entertainment (up to 1080p), 16:9 cinematic aspect ratio, anti-aliasing for smooth textures, full surround sound, HDMI output and DVD playback with upscaling capabilities right out of the box. 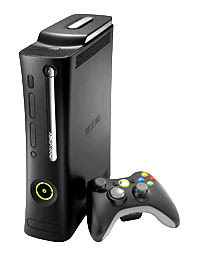 • Xbox 360 120GB hard drive. The 120GB detachable hard drive allows gamers to save their games and store television shows, movies, music, pictures, trailers, levels, demos and other content available from Xbox LIVE Marketplace.3 The hard drive is sold separately for an estimated retail price of $179.99 (U.S.). • Xbox 360 Wireless Controller (black). This award-winning, high-performance wireless controller, now in black, features the Xbox® Guide Button for quick, in-game access to friends and music. It has a range of up to 30 feet and a battery life of 30 hours on two AA batteries. It is sold separately for an estimated retail price of $49.99 (U.S.). • Xbox 360 headset (black). Now available in black, the headset lets gamers strategize or trade taunts while playing games and send voice messages to friends on Xbox LIVE. • Xbox 360 HDMI cable. New to Xbox 360, HDMI allows consumers to get HD video (up to 1080p) and multichannel surround sound, all from one cable. • Xbox LIVE Silver Membership. With this, gamers can chat with friends online, collect achievements and gamerscores, send and receive voice and text messages, and access Xbox LIVE Marketplace content such as game demos, HD movies and TV, as well as the best in downloadable games from Xbox LIVE Arcade. • One-month subscription to Xbox LIVE Gold. An Xbox LIVE Gold Membership provides a complete online entertainment experience. Those who subscribe to this premium service can engage in competitive online multiplayer matches, tailor their matchmaking via feedback and accomplishments, chat with more than one person at a time, and take advantage of unique privileges in the Xbox LIVE Marketplace and Xbox LIVE Arcade. • Xbox 360 Play & Charge kit. Complete with a charging cable and a black rechargeable battery pack, the Xbox 360 Play & Charge kit allows gamers to recharge their Xbox 360 Wireless Controller without interrupting their gameplay. It is sold separately for an estimated retail price of $19.99 (U.S.). • Xbox 360 rechargeable battery (black). The rechargeable battery pack provides more than 25 hours of gameplay per charge. It is sold separately for an estimated retail price of $11.99 (U.S.). Not only do we get an elite unit but they are also releasing elite (black) accessories in the form of a controller, headset, rechargeable battery and play and charge kit. Also of note is the price tag for the 120 gig HDD, $179.99 retail is definitely better than the rumored $200. Now I just have to convince the wife my Xbox 360 needs to be replaced with an Elite unit, anyone have any ideas? No idea, just a question. Can the Elite version stand RROD? From all that I have read, if the Elite is the newer chipset, it should have a better chance of not getting the RROD. Some people have reported they have had the RROD with the new chipsets. So, I guess it is a time versus numbers game to see what the failure rates will be.